Location : I am NOT in your bedroom stealing your socks. I had a conversation with TaroNuke about having a separate topic in the Items Section for Assist Trophys. Also, would be to much to ask for a separate topic in the "Item Discussion" section dedicated to just Assist Trophies/Pokeballs? Probability: (Chances of being summoned/doing a certain action in percentages, ratios, or whatever. Oops! Sorry, I'll get another one. Probability: (Chances of being summoned/doing a certain action in percentages. Occasionally a metal cloud floats by, doing large damage but little knockback. Probability: Low of being summoned, cloud has 10% chance of being metal. clouds have 50% chance of coming from either side of the screen. Nice game and idea! I like it. I also love the Paper-Mario-like sprites. Would the clouds also act as platforms like in the game? BTW, would you mind if this will be in the first post as the example? Greg, TaroNuke's right, your post format is fail. If you don't have anything to say that contributes to the thread, just DON'T SAY IT! Second final warning. One more spammy post and you've got yourself a four day ban this time. Location : Here, but not here at the same time. Strange, isn't it? Appearance in SNBM: Same as in Brawl, just Nukeified. Action: He is summoned like any other AT, he stays for a second but then he teleports away. (WTF? Where did he go?) He then appears in the middle of the stage, spreads his wings that suddenly appear, and shoots Off Waves that go pretty far around him. (Like he does when you fight him.) He then disappears like any other AT. The Off-Waves will be 1-Hit KO to anyone that make contact with it OTHER than the summoner and their teammates. I am impressed! Tabuu is awesome, but I don't get what you mean by nukeified. Still, Brawl fans everywhere thank you. By Nukeified, I mean in the Nuke style. Sorry if that confused you. And the Brawl fans are welcome. Update! The example (Thanks, Taro!) has been added. Action: Preform their Blizzard attack back to back or (on rare occasions) summon the Iceberg. Probability: Chances of being summoned is 1:36 (or the amount of roster characters in SNBM). 60% of the time, Blizzard. Iceberg, 40%. Appearance in SNBM: SSBB or Kirby Air Ride. Maybe Air Ride's design with Brawl's colours. Action: She would do her attack that Ridely mimicked: she stomps on the ground, then takes to the background and jets straight ahead into camera view and flies up. On rare occasions, she would drop a nice-sized amount of items before she leaves; she would drop a few rare items like stickers, CD's, etc. Probability: Between average and rare. Items occur 20% of the time. Appearance in SNBM: Take the Brawl appearance in the picture and add more detail. 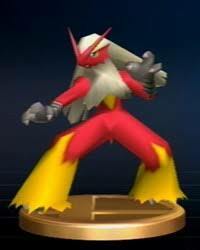 Action: Blaziken comes out and will repeatedly jump high up and loose Blaze Kick on its opponents, since it used to be its signature move. He will do it 3 times, then launch 3 floor-based Blaze Kicks, and disappear off-stage. Probability: Common due to it being a starter in 3 mainstream Pokemon games. 100% it will jump up and use Blaze Kick first. 80% it uses the floor-based Blaze Kicks, while the other 20% it stands there charging a Brave Bird attack on the ground. It will charge for 5 seconds and will go wherever the most people are. Naw, the clouds can only be stood on by the Cloud Jumpers, all it does is slow the falling of characters while pushing them a little and making them face the direction of the cloud, sort of like Mario's cape in Brawl. The character will fall through the cloud, but slower than they would if they were falling normally. This way, it'll screw recovery up, but doesn't do too much without help from the person who summoned them. Appearance in SNBM:he stands there 2 seconds charging up his attack. Action:roy uses his blazing fire attack to do a total of 35 damage that's if he hits you with the edge of his sword. Probability:he comes up at medium. Location : On that building over to the left where I can easily get a clear shot at your window. 35's a lot, and I'd say that for Roy the edge should be more powerful than the tip. How about the tip does about 15% and the edge (which causes that fiery explosion of his) does 25%? You're right, he'd be much better as a non-clone character! OMG U R CONFURMING ROY AZ UH PLAYABEL CHARACTRE!!! Not really. They should be pretty simple for the most part. Some of the more complicated effects, like following players around the stage, may take time, but on the whole they should be reasonably quick. Actually, I hate to be nitpicky, but Roy technically first appeared in Melee. His game, Fire Emblem 6, came shortly after. He was in Melee to PRRRRROMOTE his game. Hmm, well then I'll have to give him a PRRRRRRRRRRROMOTION. @ K. Xmith: It wouldn't be hard at all.